1950: In March, "The Religious Institution Temple of Light and Darkness of the True Fuke Sect", Shūkyō-hōjin Fuke Shōshū Myōan-ji, is established and opened in the Zen'ei-in, a small subtemple of Tōfuku-ji, SE Kyōto, as the official head temple of all Komusō/Fuke Shakuhachi branches in Japan. 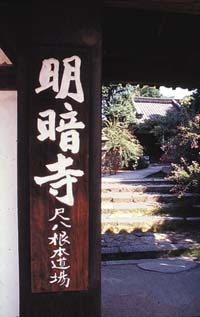 "Myōan-ji - Fundamental Spiritual Training Center for the Shakuhachi". This rather new term was most certainly invented and introduced into modern ascetic shakuhachi ideology by Yasuda Tenzan, 安田天山, 1909-1994, while he was acting as the first head monk of the modern Myōan Temple during the period of 1950 through 1953.